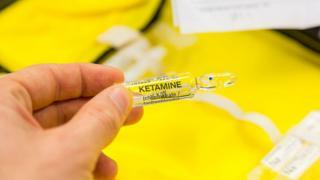 Dr James Stone, from the Royal College of Psychiatrists, told the BBC the "interesting" US study confirmed the findings from successful studies into intravenous ketamine. Prof Mitul Mehta from King's College told the BBC it was an "exciting" study. "All the studies to date have been looking at intravenous use - there are some people who have explored oral ketamine but that doesn't appear to be as successful as intravenous so intranasal seems to be a really good halfway-house. "It enters the body relatively quickly - it's not as fast as going straight into your bloodstream but not as slow as via the stomach and it's reasonably easy to control how much you give to a person. In that respect this is a really important study."